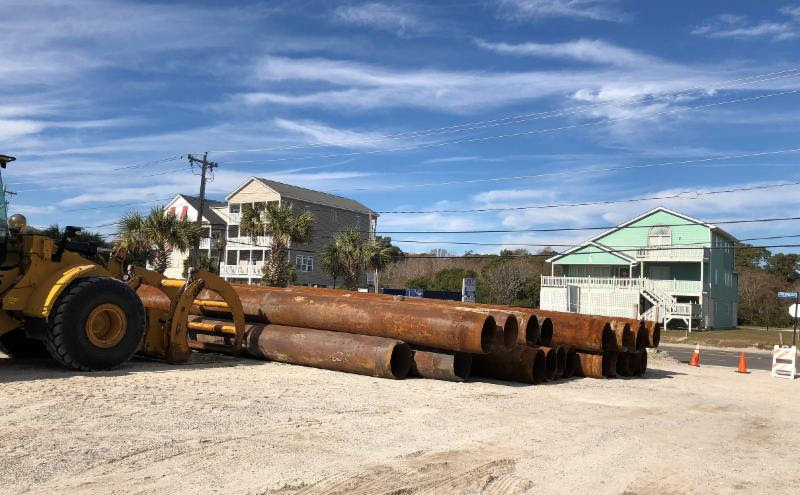 Weather and other factors permitting, a U.S. Army Corps of Engineers beach renourishment project begins in North Myrtle Beach the week of December 3. The project replaces 200,000 cubic yards of sand lost to Hurricane Irma. Based on U.S. Army Corps of Engineers beach profile measurements, sand is to be placed from about 17th Avenue South to 7th Avenue North, and should take several weeks to accomplish. Great Lakes Dock & Dredge has begun stockpiling pipe at the 7th Avenue South street end and has established its first onshore pipeline at 15th Avenue South. The entire beach renourishment project is entitled, Myrtle Beach Shore Protection Project and includes portions of beaches in Garden City/Surfside Beach, Myrtle Beach and North Myrtle Beach. The North Myrtle Beach phase was to begin in September, but Hurricane Florence delayed it. Great Lakes Dock & Dredge is winding up the Myrtle Beach portion of the project. To follow the location and progress of the renourishment project, please visit the U.S. Army Corps of Engineers site at https://www.sac.usace.army.mil. On the home page under the heading of Routinely Requested, click on GIS Portal, then Web Mapper, then Myrtle Beach Web Mapper.